Chemical fume hoods play a vital role in containing or removing hazardous fumes, vapors or radioactive materials from a lab setting. Fume hood technology has continuously improved for more than 50 years to enhance safety, efficiency and ease of use. Properly installed and certified hoods allow laboratory personnel to work with harmful materials at close range, safely and conveniently. 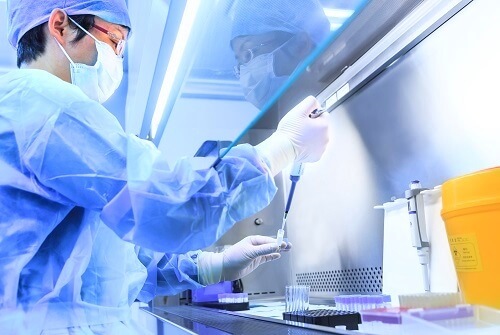 PSA designs and outfits laboratories as a complete system and will help you choose the right model, design and positioning for operational safety and efficiency in the laboratory. Your choice of hood design and model depends heavily on your application. PSA Laboratory Furniture has extensive experience installing safety equipment for labs across all industry types throughout the world. View some of our past work in our fume hood gallery. High performance fume hoods have low flow for greater efficiency. They have lower installation costs and reduced operating costs. Airfoil bypass fume hood models reduce turbulence of airflow through the unit, improving efficiency and performance. “Add air” fume hoods use a plenum to provide the majority of outside air required by the hood in a uniform, regulated supply. These hoods are designed for low benches, allowing ventilation of large equipment or other oversized objects. Highly-corrosive perchloric acid is stronger than sulfuric acid and poses an explosion risk in labs. Perchloric acid fume hoods are designed to not react with this volatile inorganic acid. Fume hoods designed for handling radioactive materials isolate radiation from users and from the environment. Radioisotope hoods are single-purpose and should not be used in any other application. Walk-in hoods reach completely or nearly-completely to the floor, allowing you to set up or manipulate large equipment inside the hood (while venting is disengaged). Ductless demonstration hoods provide 360° of visibility for education, vocational training or workforce development applications. Local exhaust ventilation ducts, commonly called snorkels or elephant trunks, are mobile venting ducts designed to capture rising vapors (such as gases lighter than air). Canopy hoods are similar to snorkel hoods, except they remain in a single fixed position, much like a range hood in a kitchen. Variable air volume hoods are alternatively known as “constant air velocity hoods.” VAV hoods adjust air volume based on sash position, maintaining a constant flow velocity. Thin wall fume hoods are functionally identical to standard hoods, but accommodate larger equipment by using thinner front posts. Special wiring or plumbing situations may preclude installation of thin wall hoods. View our past work in our fume hood gallery. 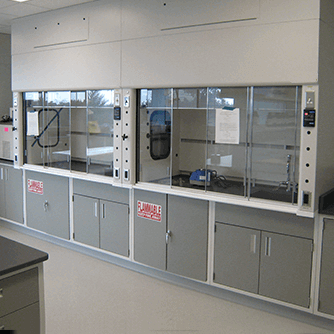 Highline interior clearance of 60"
Biological safety cabinets (BSC) are similar to chemical fume hoods as they ventilate laboratory workspaces. However, BSC are specially designed for the removal of biological pathogens. Three different classes (Class I, Class II, and Class III) offer various levels of protection. The type your lab needs will depend on the pathogens used in your applications. BSC are recommended for medical laboratories, food processing plants, and water and wastewater management facilities. Learn which class of cabinet is right for your work. Custom hood sizes and materials are available. Talk to our chemical fume hood sales team for detailed options or visit Laboratory Fume Hood Energy Model to calculate your fume hood energy usage. 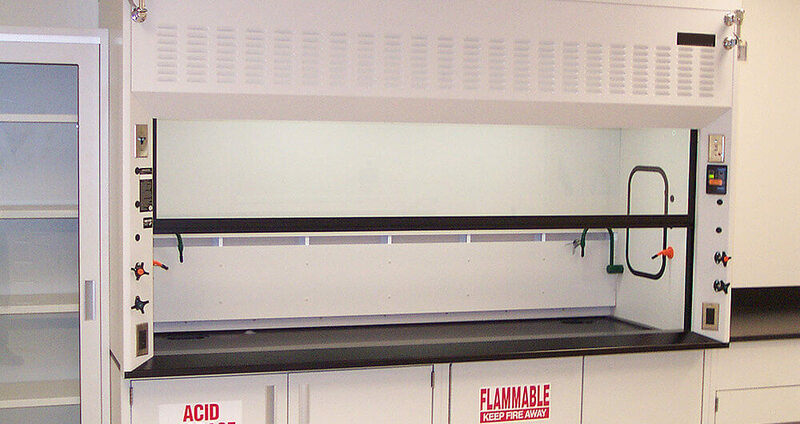 A properly functioning fume hood can be the difference between a safe lab and a dangerous work environment. Fume hood placement is just as important as the type. The right location will ensure you have optimal ventilation for your work. Using CAD renderings, our designers will find the right placement for all your lab furniture and equipment. 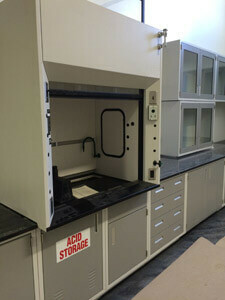 PSA Laboratory Furniture offers professional fume hood installation and delivery. We handle every part of installation, including hooking up power and exhaust lines. We also offer to deliver materials only without installation services. In these cases, we offer phone support to ensure the installation process goes smoothly. To keep lab workers safe, fume hoods must meet or exceed regulatory ventilation compliance. This is mandated by the ANSI/AIHA/ASSE Z9.5-2012 Standard for laboratory ventilation. Whatever fume hood you select, PSA Laboratory Furniture will provide ventilation testing and certification after installation. Our experts inspect every element so you know your fume hood works and meets industry standards. For Midwestern labs in the US, we can provide regularly schedule certification so your lab stays safe and up-to-date. 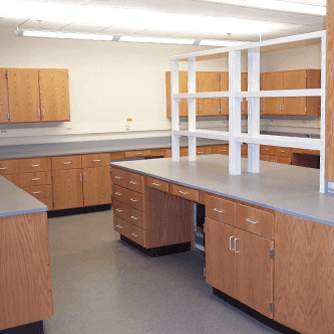 Countertops – PSA Laboratory Furniture has many materials for cabinets, including epoxy, wood, and steel. Modular steel – Modular lab equipment can be easily modified based on our workload while steel can withstand daily wear and tear. 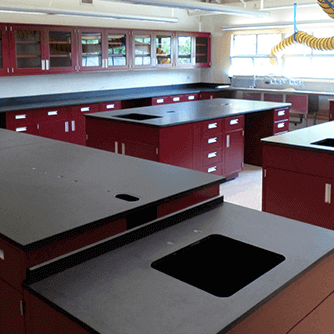 Wood casework – Oak, maple, and cherry hardwoods are available for wood lab furniture. Flexible systems – Create a mobile lab with flexible systems from PSA Laboratory Furniture. 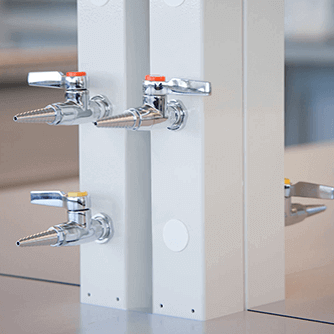 Accessories – Lab accessories include everything from sinks and faucets to balance tables and support rods. 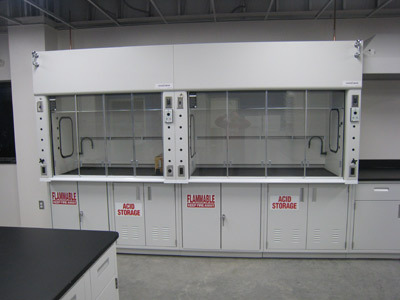 PSA Laboratory Furniture offers installation of all lab equipment, including fume hoods. 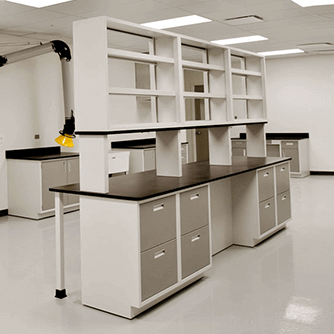 Contact our team for a free quote on lab furniture designs, installation, and certification. 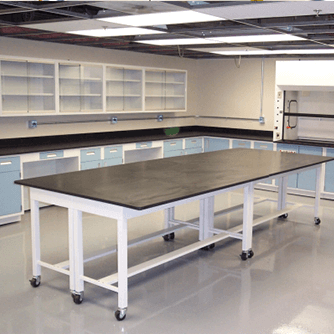 Whether you are upgrading your current lab or building a new one from scratch, PSA Laboratory Furniture designers are ready to help you. Talk to PSA’s chemical fume hood designers to improve safety and reduce lab costs at your facility.